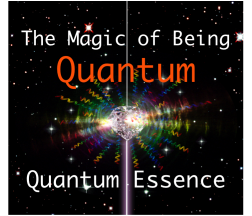 The Magic of Being﻿ ﻿﻿﻿Quantum ﻿series. With the Quantum Essence we discover how to channel our own divine essence. As we touch into the energy of our Quantum Essence we are encouraged to say yes to more of ourselves; to accept our highest possible connection to the deepest loving expression we can be in any moment. This could be referred to as our Quantum Quotient (QQ), where we are always topping up our presence to its optimum level, always in harmony with our own divine loving self. How does it feel to be with this energy? Quantum Essence takes us beyond the personal to the oneness of source, our God selves, to our unfathomable infinite soul-fullness. I feel this inside my body rather than ‘out-there’. Often I feel a very high vibration in my cells, a blissful feeling where every part of my body responds. I also have a feeling of well-being, of being cared for, of being loved. The love can be very emotionally charged, often tears of joy and gratefulness result. The Magic of Being ﻿Quantum ﻿ says it all, a Magical Journey – delightful. Many of you who have experienced problems have been challenged to find any magic, especially when physical or emotional pain is being experienced. Yet you have found us here so you are already on your path to finding a higher expression of yourselves, which is where this Quantum Essence journey will assist. I have found that the energy is so pure and fine any resistance clears very quickly (if we allow). We never quite reach the destination however, as the moment we reach a new point of awareness we see there are many more to experience, perhaps a finer vibration, a new portal to explore, more downloads of divine codes (the list goes on). When we have practiced accepting our divine essence and the love that comes with this we can begin to understand the breadth and depth of our consciousness. What do we see and hear when we are in this level of awareness? Once we are in Divine Essence we experience the singularly of oneness – of our ‘all that is-ness’. The next challenge is to be with the energy and then to do whatever wishes to be expressed in the moment. This might be the words for a book, a blog or a poem, it might be musical notes or a song, perhaps some images for a piece of art, a cartoon sketch… whatever it is if you channel the creative impulse from your divine essence you will be bringing your core-self into alignment with all of your creative capabilities. The results can be astounding. Tapping this creative impulse can be a new experience. For example I would get myself into the flow of energy (vibrating all over the place) and then sit in front of my computer ready to write whatever came through in the moment. ‘OK I’m here, let’s go’ I’d say to myself, tune in and off we go…..
I’d sit there a while, then realise quickly that this is not necessarily the best way forward. Next I try to record a video that will introduce the Being Quantum series. I had the headings so I just needed to enthuse about it to camera for a few minutes, to catch your attention. I even wrote a script. Needless to say none of this worked, so I asked some friends what they would do – ‘why not try a teleseminar, that would get the energy flowing, tell others about it like you just did with us, share it’. Guess what, that did work. Emanating into your midst via Meredith. I spoke before about the challenge I had in accepting I was part of Sananda. Now this block is out of the way the energy has been wonderful and the words have been flowing much easier. By the way it was such a good block I had to play a recording of one of Meredith’s answers (I was taking part in one of her Soul Fests and asked Archangel Michael – ‘How could I be Sananda?’). The answer was so good I played it back to myself every night for a month… only then did I slowly accept the energy and the flow of myself as Sananda. Even now I still need a top up when my confidence drops and a voice asks me that question again “how can I be Sananda?”. With Quantum Essence we go deeper than we have ever gone before, we touch into our quantum pulse and then go beyond, touch further into our essence, right to source, then further.